So, a friend of mine just got married. Another just started a relationship! Wow, this is amazing. Wait a minute… She’s been married for years, even has kids! He’s been dating her for months now (ok, it got a bit rocky there, but…). This is an example of a broken, but funny interface. You filled out your profile on day one with the least possible information that would let you join. Two months later, you realize it says you are single! So you fix that. The next morning some joker, probably your best man or something, offers his congrats! 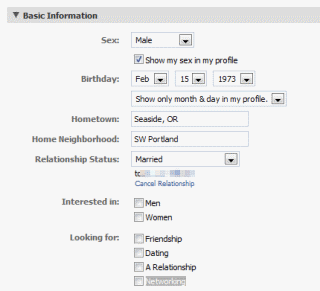 It’s ok to make a checkbox for married on your bank’s site, but really, this is a social networking site. They should actually get this simple stuff right. Send me your examples of “broken”!